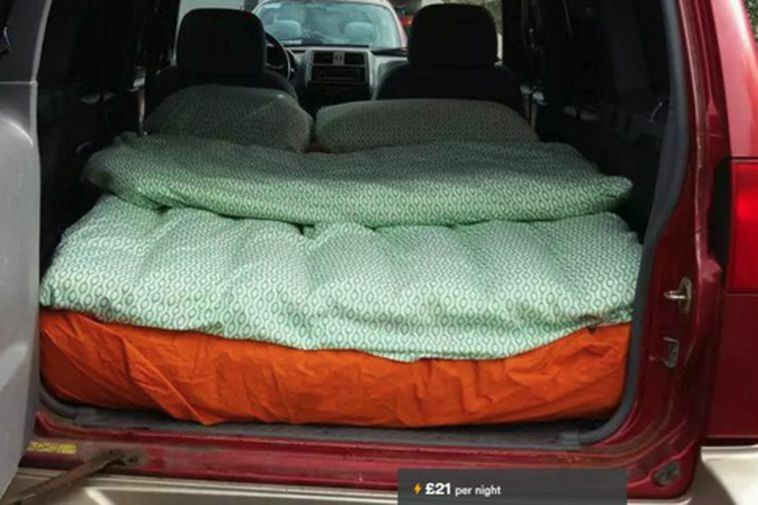 Airbnb users now have the option to spend the night in a parked jeep in a driveway in Grafarvogur, a suburb of Reykjavik for the "mere" price of £21, including WiFi. The accommodation offers a mattress in the trunk of a car and guests can either use the duvets provided or bring their own sleeping bag. In the ad on Airbnb the owner precises that guests can by no means drive the jeep, only sleep in it. "Tere is no heater in car but you can charge Your phone and use WiFi. There is a nice Coffee and gas station about 500 m from the car and swimming pool above 900 m." states the ad. It also states that you cannot bring a pet into the vehicle and it's for non smokers only. After a bit of research this seems to be the only car advertised as sleeping accommodation in Iceland but you can however sleep in a car in Switzerland which offers the accommodation for 31 USD per night. A man did make headlines in January 2015 for offering people an overnight stay in his Tesla in Arizone for 85 USD. On another note, we would like to add that Grafarvogur, where this interesting accommodation option is available, is the birthplace or "hood" of many of Iceland's popular rap artists. Here below you can see the young Aron Can going about his business in Grafarvogur.